This is a list of people who have appeared on coins of the United Kingdom. The reigning monarch appears on the obverse of all coins, thus most of these listed were on the reverse. Names and titles listed are those of the person when the coin was struck, or on their death, whichever was first. The list does not include the national effigy Britannia who has featured on many circulated, commemorative and bullion coins. 2017: Two pound coin marking 200 year since her death. 2004: Fifty pence piece marking fifty years since he did the first four-minute mile (face not shown). 2006: Two pound coin marking 200 years since his birth. 2015: Five pound coin to mark the centenary of World War I. 1981: Twenty-five pence piece marking his wedding to Lady Diana Spencer. 1998: Five pound coin marking his 50th birthday. 2008: Five pound coin marking his 60th birthday. 1965: Crown marking his death. 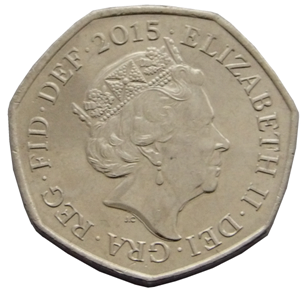 2015: Five pound coin marking the 50th anniversary of his death. 2009: Two pound coin marking 200 years since his birth. 1981: Twenty-five pence piece marking her wedding to Prince Charles. 1999: Five pound coin marking her 1997 death. 1980: Twenty-five pence piece marking 80th birthday. 2000: Five pound coin marking 100th birthday. 2008: Five pound coin marking 450 years since accession. 2009: Five pound coin marking 500 years since accession. 2014: Two pound coin marking 100 years since the outbreak of the First World War. 2005: Five pound coin marking 200 years since his death. 1997: Five pound coin marking 50 years since his marriage to Queen Elizabeth II (featured on obverse). 2011: Five pound coin marking his 90th birthday. 2001: Five pound coin marking 100 years since her death. ^ Mendick, Robert (31 December 2016). "Jane Austen possesses good fortune as face of banknote and £2 coin". The Daily Telegraph. Retrieved 14 June 2017. ^ "Roger Bannister Fifty Pence Coin". The Royal Mint. Retrieved 28 September 2017. ^ "Two Pound Coin". The Royal Mint. Retrieved 18 February 2013. ^ "WW1 nurse Edith Cavell to feature on new £5 coin". BBC News. 5 July 2014. ^ a b "25 New Pence (1981) Wedding of Charles and Diana". World Coin Gallery. Retrieved 18 February 2013. ^ Webster, Daniel (13 June 1998). 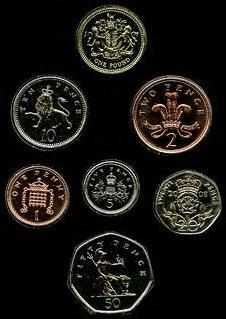 "New coins feature Queen Elizabeth's face". The Free Lance-Star. ^ a b Bellavin, Lisa (21 January 2008). "British Royal Mint Announces New Commemoratives". NumisMaster. Retrieved 18 February 2013. ^ Charlton, J. E. (19 November 1965). "Coin Corner". The Calgary Herald. ^ "Crown (1965) Winston Churchill". World Coin Gallery. Retrieved 18 February 2013. ^ "The 50th Anniversary of the Death of Sir Winston Churchill 2015 UK £5 Brilliant Uncirculated Coin". Royal Mint. Retrieved 27 December 2014. ^ "British Royal Mint Issues 2009 UK Charles Darwin £2 Coins". Coin News. 13 February 2009. Retrieved 18 February 2013. ^ "Britain launches Diana coin". Bangor Daily News. 6 January 1999. ^ "25 New Pence (1980) Birthday of Queen Mother". World Coin Gallery. Retrieved 18 February 2013. ^ "Coin celebrates Queen Mother's 100th birthday". Sarasota Herald-Tribune. 11 January 2000. ^ a b c d e "Five Pound Coin". The Royal Mint. Retrieved 18 February 2013. ^ "Saint George the Dragon Slayer". The Royal Mint. Retrieved 18 February 2013. ^ "Marking the 800th Anniversary of the Magna Carta". Royal Mint. Retrieved 1 October 2016. 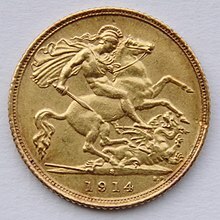 ^ "Kitchener 'Your country needs you' coin offensive, says Dai Lloyd". BBC News. 14 January 2014. Retrieved 27 December 2014. ^ "5 Pounds (1997) Golden Wedding Ann". World Coin Gallery. Retrieved 18 February 2013. ^ "2007 UK £5 Gold Proof Diamond Wedding". Goldprice. 4 April 2007. Retrieved 18 February 2013. "Coin Designs and Specifications". The Royal Mint.